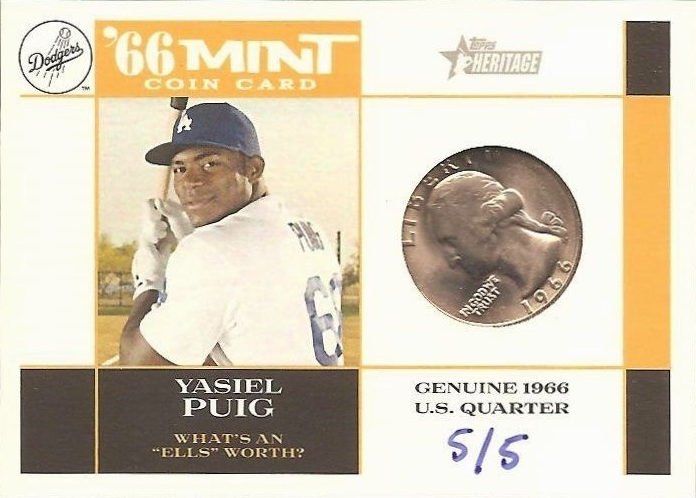 I'm not done posting about Topps' 2015 Heritage Baseball card set yet. Featured below are the remaining autograph, relic, box-loader and other insert Dodger cards found within it. In fact, all that remains are the Walmart exclusive Sandy Koufax subset called "A Legend Retires." I hope to have photos of all of those cards soon. Go here to check out all of my past post on this set. Unfortunately, it doesn't appear that any of the Dodger autographed cards were seeded into packs (save the "1 of 1" cut signature cards). Below is the known checklist. 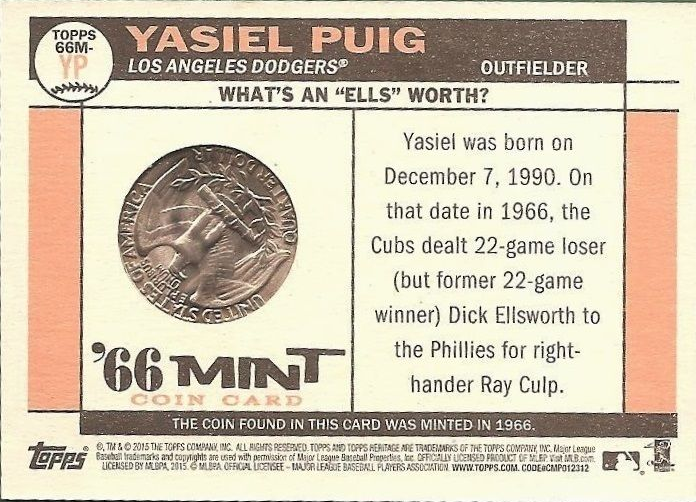 The below '66 Mint coin cards are very scarce. Four different variations are know: Nickel #/15, Dime #/10, Quarter #/5, JFK Silver Dollar 1/1. 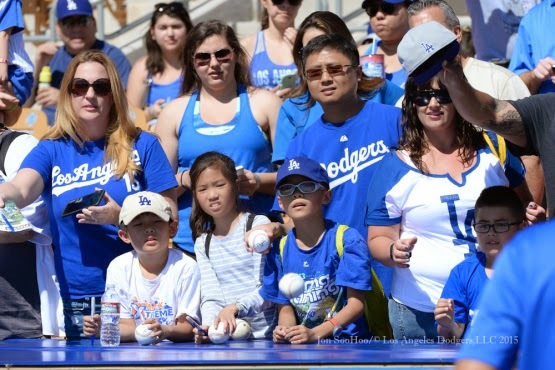 A SAN FRANCISCO TREAT: The Dodgers, unbeaten in their last five games, take on the Giants at Scottsdale Stadium today in the first of two Spring Training meetings between the clubs. Last year, Los Angeles won seven of its last nine games against the Giants and took the season series, 10-9, en route to a second consecutive division title. The Dodgers posted their second-best divisional winning percentage last year, going 50-26 (.658), and will play NL West clubs in three of their next four Cactus League contests. Opening Day is just FOUR WEEKS AWAY, Monday, April 6 vs. San Diego. 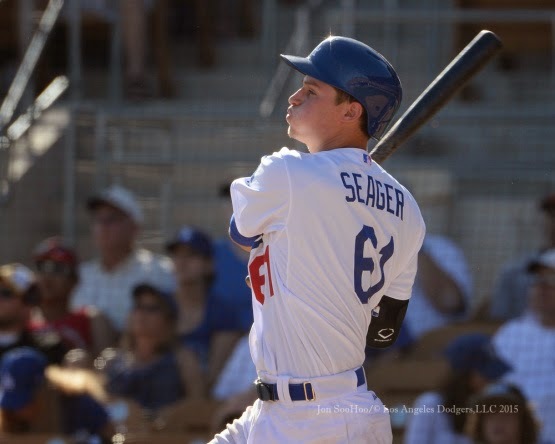 WALK-OFF THIS WAY: Corey Seager’s double to deep center field in the ninth inning scored the game-winner yesterday, as Los Angeles improved to 4-1-1 on the spring with a 4-3, walk-off win over the Brewers at Camelback Ranch. Brandon McCarthy made his Dodger debut, allowing one run on two hits in 2.0 innings and racking up two of Los Angeles’ 11 strikeouts, and Kyle Jensen powered his second homer of the spring in the victory. The Dodgers have now played 41 consecutive errorless innings and have committed just one error through their first six Cactus League contests. 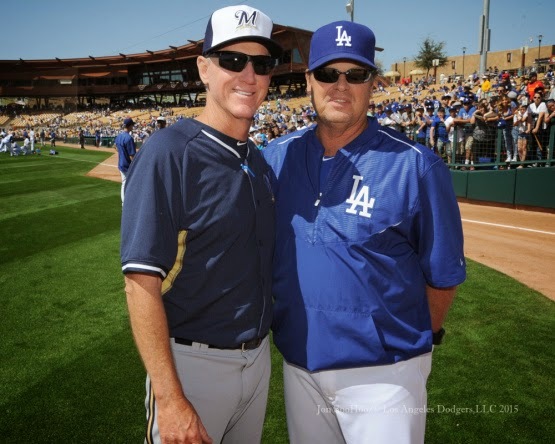 Los Angeles pitchers have combined to post a 3.33 ERA and limit opposing hitters to a .209 batting average this spring, striking out 47 and walking only 11 in 54.0 innings. 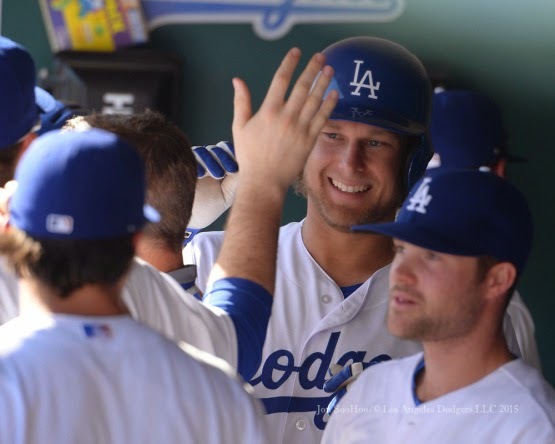 The Dodgers are averaging six runs per game and have posted a .281 team batting average. ON THE MOUND: Left-hander Brett Anderson will make his Dodger debut and his first start of the spring today. He was limited to only eight starts with Colorado last year by a broken left index finger and lower back surgery but, when healthy, Anderson has posted a 1.29 WHIP and has limited opponents to a .316 on-base percentage during the course of his six-year MLB career. He has only given up only 41 home runs in 494.0 innings in his big league career, averaging only 0.75 home runs per 9.0 innings. Veteran LHP Erik Bedard is expected to make his second appearance of the spring today after allowing one run on two hits in 2.0 innings and taking the loss on Wednesday against the White Sox. He has averaged 8.60 strikeouts per 9.0 innings and has posted a 2.34 strikeout-to-walk ratio in 241 career big league games (230 games) over 11 seasons with Baltimore (2005-07), Seattle (2008-09, ’11), Boston (2011), Pittsburgh (2012), Houston (2013) and Tampa Bay (2014). 25-year-old RHP Carlos Frias will make his second appearance of the spring today after allowing two runs on three hits in 2.0 innings on Wednesday vs. the White Sox. In his first big league season last year, Frias was 1-1 with a 6.12 ERA in 15 games (two starts) during two stints with the Dodgers. RHP Brandon League is also expected to see action today after striking out one in a scoreless frame on Thursday against the White Sox. In 2014, League did not allow a home run in 63.0 innings of work, the most innings by any NL pitcher without allowing a home run. RHP Chris Hatcher is expected to appear in today’s game, after pitching a scoreless inning of relief in his first action of the spring on Thursday against the White Sox. Hatcher made his big league debut in 2010 as a catcher and returned the next year as a pitcher, becoming just the first player since 1935 to do so (last: Art Doll, Boston Braves, 1935). 24-year-old RHP Yimi Garcia will make his second appearance of the spring today after tossing a scoreless frame on Friday against the Brewers. Garcia saw his first big league action last year and posted a 1.80 ERA (2 ER/10.0 IP) in eight games with Los Angeles. Also suiting up for the Dodgers today will be minor leaguers RHP Steve Smith (#95), RHP Jeremy Kehrt (#88) and LHP Mike Thomas (#89). 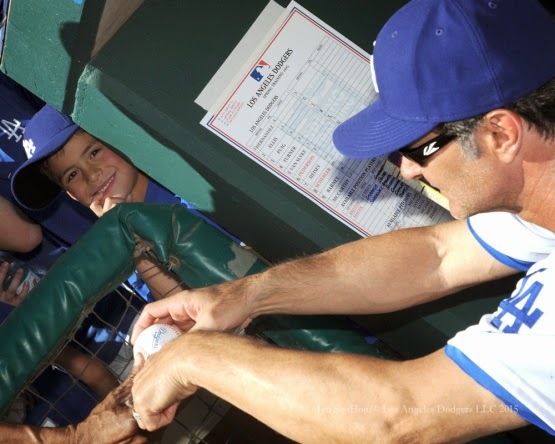 30 IN 30: MLB Network’s 30 Clubs in 30 Days will be on-site tomorrow for an inside look at Dodger camp. The hour-long special, complete with field reports, interviews and predictions, will air tomorrow at 4:00 p.m. PT on the network.